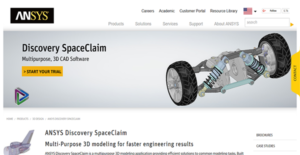 What is ANSYS Discovery SpaceClaim? ANSYS Discovery SpaceClaim is a fast and simple but comprehensive 3D modeling software. It has a gentle learning curve, enabling users new to the software to utilize its multifarious tools to their fullest capacity swiftly. With ANSYS Discovery SpaceClaim, users can expeditiously produce solids or use modeling functions even while they reference an STL model. This makes work faster, enabling individuals and teams to complete projects quickly. Plus, ANSYS Discovery SpaceClaim allows users to proceed to the analysis at a more rapid pace. The solution facilitates that by abstracting geometric bottlenecks by enabling users to retrieve files from any CAD application, edit, and prepare them directly from the interface. ANSYS Discovery SpaceClaim is designed to be simple and easy-to-use. With its gentle learning curve, new users can create the models that they envision without problems, regardless of the complexity. Additionally, Discovery SpaceClaim offers 2D and 3D drawings with fine details that are rendered photorealistically, for high-quality presentations of designs. ANSYS Discovery SpaceClaim has a host of data editing tools that allow users to import CAD files from any CAD system to further improve them in the ANSYS interface. This flexibility eases bottlenecks that file imports may cause, enabling teams to work seamlessly and expeditiously. CAD files can be corrupted, or they can be unclean and partial. This can lead to problems in the completion but with ANSYS Discovery SpaceClaim, users can automatically repair such problems. This way, time to finish is accelerated. ANSYS Discovery SpaceClaim is a versatile solution, which means it can process 3D data for whatever application the models are meant for. This makes the production stage more efficient and also less arduous. Problems with modeling can lead to more downtime on the shop floor, resulting in less income generation. That is why ANSYS Discovery SpaceClaim is designed to connect with Traceparts and Cadenas libraries, as well as CAM providers such as MecSoft Corporation. These integrations serve to hasten the design phase for the faster completion of projects. If you are considering ANSYS Discovery SpaceClaim it could also be a good idea to investigate other subcategories of Best CAD Software listed in our base of B2B software reviews. Enterprises have different wants and requirements and no software platform can be just right in such a situation. It is pointless to try to find a perfect off-the-shelf software product that meets all your business needs. The wise thing to do would be to customize the solution for your specific needs, employee skill levels, finances, and other elements. For these reasons, do not hurry and pay for well-publicized popular applications. Though these may be widely used, they may not be the ideal fit for your unique wants. Do your groundwork, look into each short-listed system in detail, read a few ANSYS Discovery SpaceClaim reviews, speak to the seller for clarifications, and finally settle for the application that offers what you require. How Much Does ANSYS Discovery SpaceClaim Cost? ANSYS Discovery SpaceClaim is a 3D modeling interface with a gentle learning curve. Individuals, teams, and companies interested in the product can ask for more information and request for their custom enterprise pricing online via the website form. We realize that when you make a decision to buy CAD Software it’s important not only to see how experts evaluate it in their reviews, but also to find out if the real people and companies that buy it are actually satisfied with the product. That’s why we’ve created our behavior-based Customer Satisfaction Algorithm™ that gathers customer reviews, comments and ANSYS Discovery SpaceClaim reviews across a wide range of social media sites. The data is then presented in an easy to digest form showing how many people had positive and negative experience with ANSYS Discovery SpaceClaim. With that information at hand you should be equipped to make an informed buying decision that you won’t regret. What are ANSYS Discovery SpaceClaim pricing details? What integrations are available for ANSYS Discovery SpaceClaim? If you need more information about ANSYS Discovery SpaceClaim or you simply have a question let us know what you need and we’ll forward your request directly to the vendor.